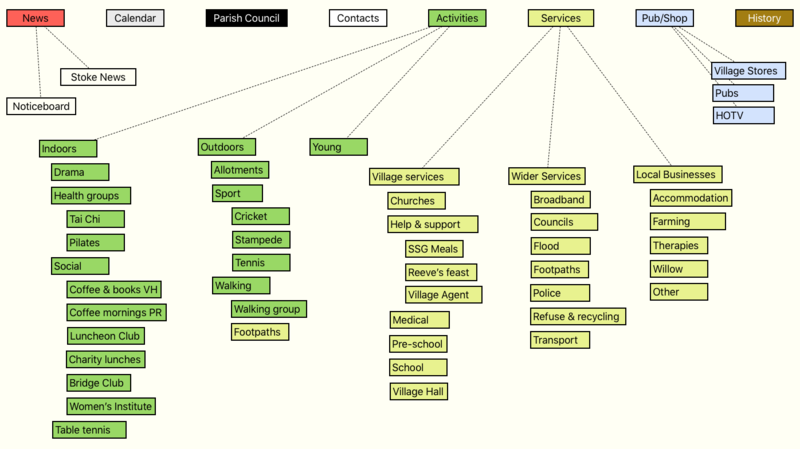 In order to free up a tab to dedicate to the pubs, the shop and the Heart of the Village project (which is likely to generate a lot of data in the coming months), we have combined the previous items from Services and Businesses under a single Services tab. This was always a slightly fuzzy distinction, and by making the menus hierarchical (sections and sub-sections) we should actually have made it easier to find things. The Activities menu has also been made hierarchical, and a Noticeboard section has been added, accessible via the News page. The accompanying diagram illustrates the whole lot at a glance. As ever, please email with corrections or missing information. We do try quite hard to keep the website up to date, but we rely on people feeding us information at the right time and identifying dead wood. We also welcome photos that can be added to any of the sections to enliven and inform. Send these in any format and we can adapt them for use as necessary.